Could you be Adventure Island's Santa Claus? Southend's No. 1 Theme Park is 'ho ho' hoping so! Have you got what it takes to be Adventure Island's Santa Claus this coming Christmas? Christmas may seem a long way off when the sun is shining and we're all thinking about where we're going to head off to for the summer holidays, but Lizzie Smith from Adventure Island is busy planning the fun park's Christmas activities. She has been given the mission of finding a Santa Claus for the Park's Grotto this winter and is on the look out for at least 5 jolly Santa's to meet and greet the children and their families who will be visiting the exciting new Grotto this coming winter. 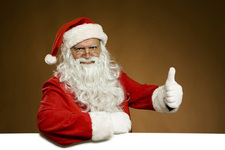 "We are looking for 4 or 5 super friendly Santa's who must be 5ft 8inches or taller." Lizzie tells me. "They must be willing to work weekends and evenings for up to 6 days a week from the 28th November to the 24th December." The Park would prefer candidates who have some acting experience, although it is not essential. Lizzie adds, "They must be self disciplined as there will be times when they are on their own so self motivation is important. " You will be working on a zero hours contract with a salary of £6.50 plus holiday pay. You will also be given a discount card which will give a whopping 50% off food and drink in the park. Full outfits including wigs, beards and glasses will be provided. Lizzie says, "We can also offer a discount if they wish to bring their friends and family to the grotto!"